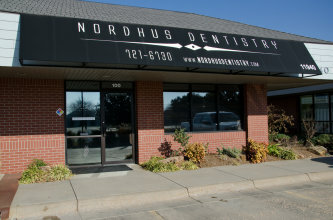 At Nordhus Dentistry, we strive to create a warm and comfortable atmosphere. We want your experience to be like none other by experiencing the best team a dental office has to offer as well as some pleasantries such as a warm moist towel after treatment, a cup a coffee from our Starbuck’s coffee machine, and friendly conversations! Nordhus Dentistry uses the latest advances in technology including digital x-rays, laser decay detection and intraoral cameras to help you maintain a beautiful smile. Dr. Nordhus practices several cosmetic procedures such as implants, veneers, laser dentistry and tooth colored fillings that will improve your smile. We offer Invisalign for those who desire straighter teeth. One of our favorite items of technology is the digital iTero scanner. Meaning, no gooey mess associated with impression materials! We, also, are providers of the latest in-office whitening system, ZOOM!, that is priced to make it affordable for everyone. Dr. Nordhus has earned extensive advanced clinical education, maintaining membership in multiple professional organizations, including the Academy of General Dentistry, the Academy of Laser Dentistry, and the American Academy of Cosmetic Dentistry. He also serves as a part time faculty member in The Advanced Education Program in General Dentistry (AEGD) at Wichita State University’s College of Health Professions. Call or email us today to schedule a complimentary consultation so you can "smile more" while improving your overall dental health.